Eversafe prefab Garage Building Kits are manufactured using galvanized steel, giving you increased protection against rusting and corrosion. 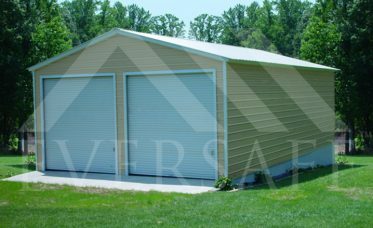 With the flexibility of full Steel Garage Building customization, you can design your Garage based on your own specifications. 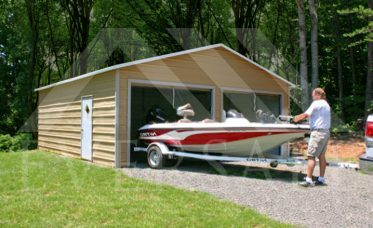 Choose the width, length, height, roof style, even the color of the roof, walls, trim and doors, the design possibilities are endless. All of our Prefab Steel Garage prices include installation. 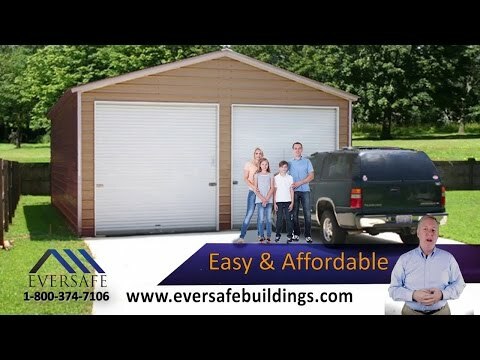 Eversafe’s 1 car steel garages are perfect if you’re looking for space to store your car, truck, lawn equipment or any personal items that are taking up too much space in your home. Building widths range from 12’ wide up to 18’ wide and typical lengths are 20’ to 25’ long. 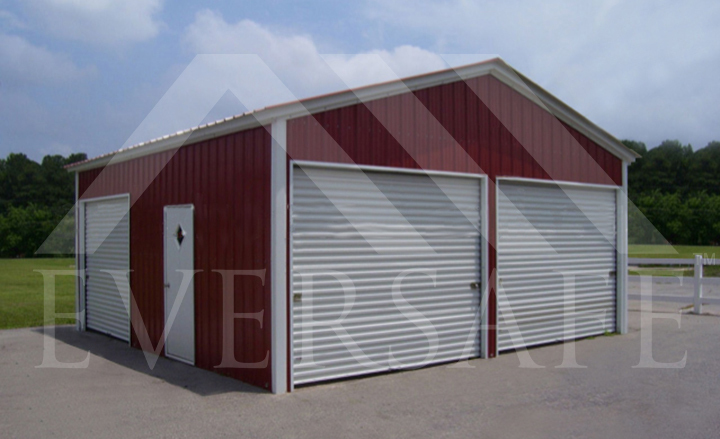 Choose from a regular roof, boxed eave roof or vertical roof to customize your building. 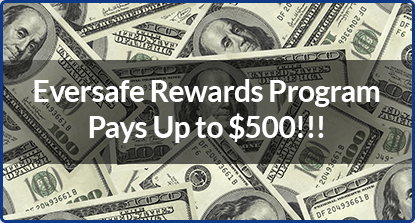 Click here to see our 1 car garage price specials. 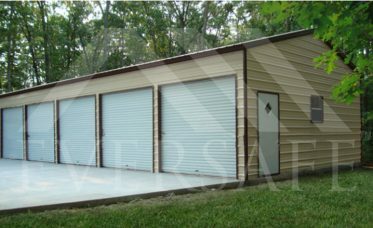 If you’re looking to store more than 1 car or you need the additional space for storage or a workshop, Eversafe’s 2 car garage is what you’re looking for. Our 2 car metal garages start at 20’ wide and go up from there. 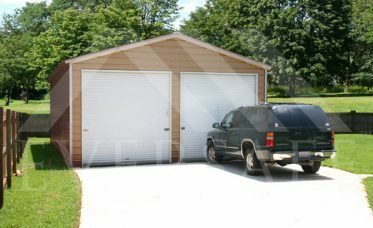 The garage doors can be installed on the gable end or the eave side of the building. 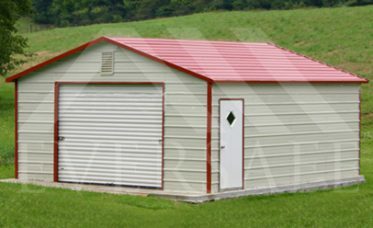 Choose from many different colors for the roof, walls and trim to customize your building to match any existing structures on your property. 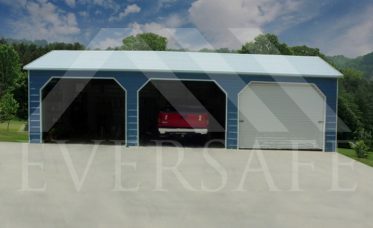 Click here to see our 2 car garage price specials. Our 3 car garage buildings offer even more space. Starting at 22’ wide and 35’ long, you can choose any dimensions you need to ensure you have enough space for multiple cars, storage or a workshop. Add a walk door and a few windows for easy pedestrian access and additional natural light. 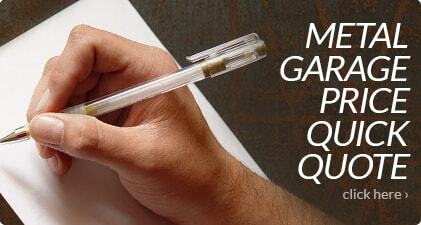 You can also choose our 2-tone wainscot finish to add an attractive custom look. 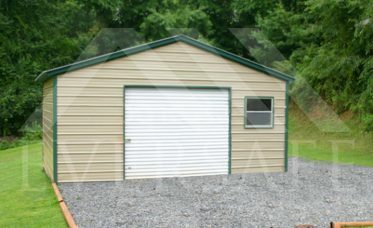 Click here to see our 3 car garage price specials. Eversafe Buildings brings you the best prices for prefabricated metal garages in the industry and the best variety of steel buildings to meet your needs. 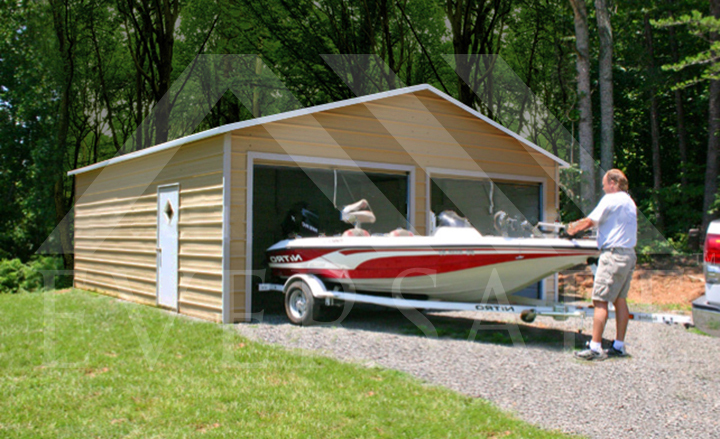 We offer 14 gauge and 12 gauge framing along with 29 gauge and 26 gauge roof and wall sheeting. 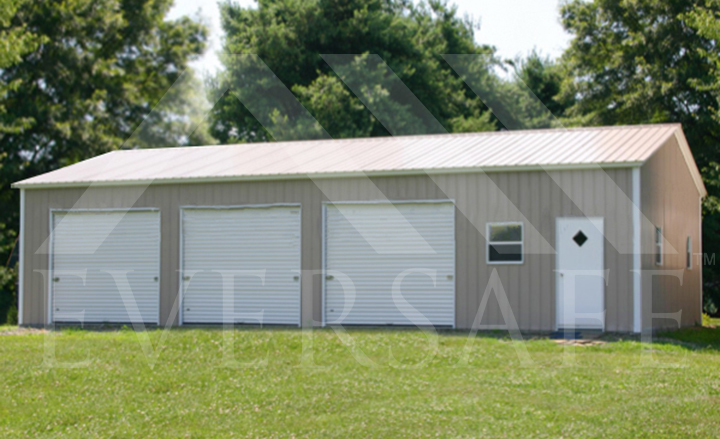 Our buildings can be certified, if required, by a state registered engineer to certify that the buildings meet local structural building code requirements. 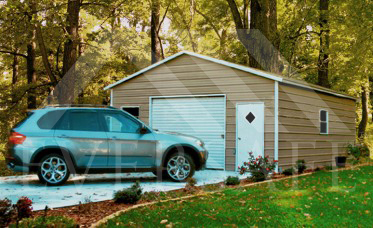 Our garages can be designed to meet up 180mph wind loads and up to 60psf snow loads. 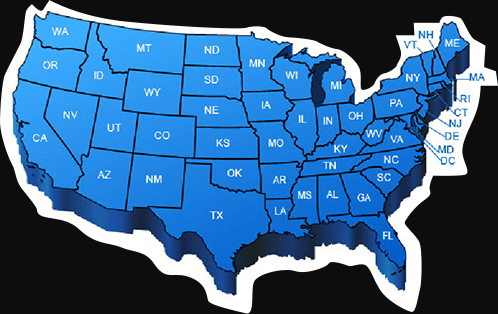 Wind and snow loads vary by state. 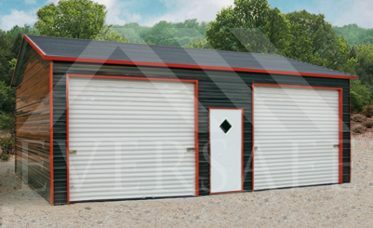 Prefab garage buildings allow you to immediately increase the value of your property and get more use out of it either as a workshop or for storage. Imagine being able to have your own metal prefab garage building ordered, built and installed in a fraction of the time that it would take to have concrete or wood constructed? 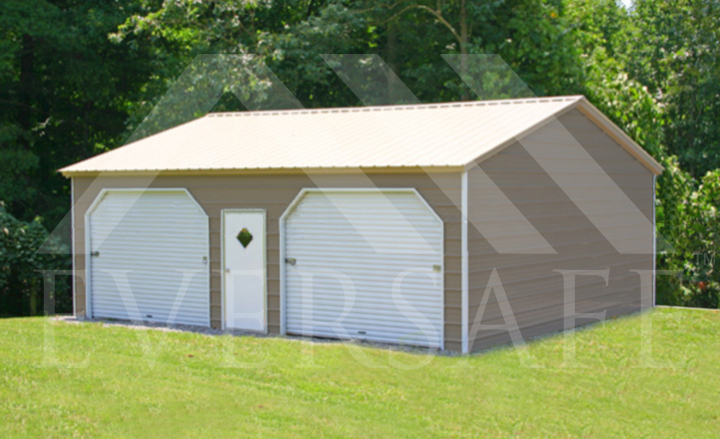 Imagine also that it costs a fraction of the price and once constructed by our crews, an Eversafe structure requires almost no upkeep. This is why steel is the way to go, especially if you are working with a tight budget and a short time span. Prefabricated garage buildings are also in high demand because they are the most durable. 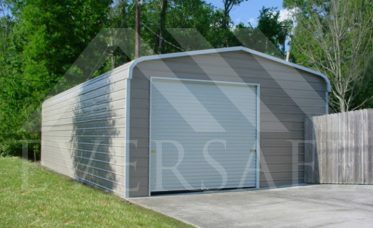 These metal structures are able to withstand hurricane-force winds and engineer certified to meet Florida wind codes and Texas windstorm requirements. 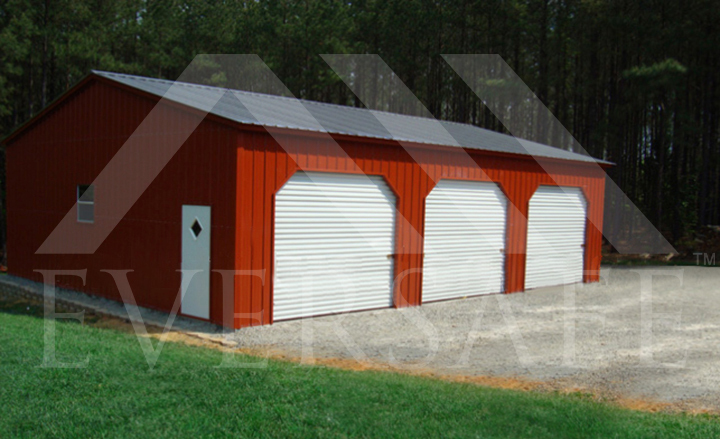 The all steel framing does not crack or warp and helps prevent mold and mildew as it does not absorb moisture like wood does. 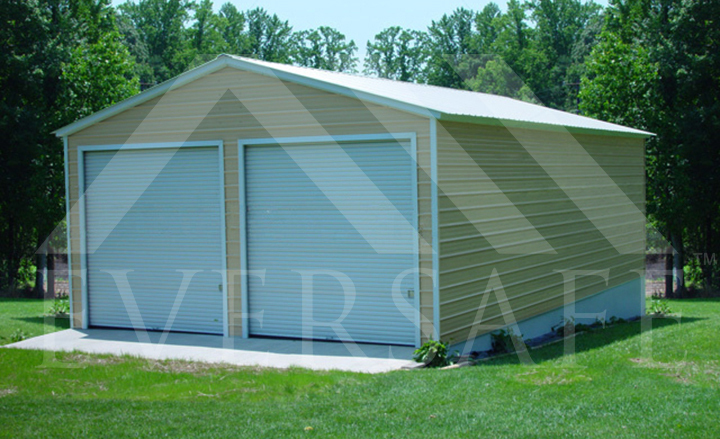 The building kits can be easily elevated or designed with flood vents if required to help prevent surging flood waters from damaging the structure. These buildings require little maintenance, come with long warranties and can be used to reliably store vehicles, house hold goods, perishables and other items. Eversafe steel garage buildings can be ordered online for a great low price. 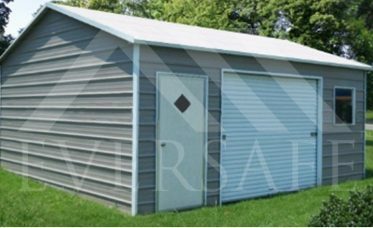 As you browse our site, you will see a great selection of these metal prefab garage buildings and information about sizes, styles, installation and more. 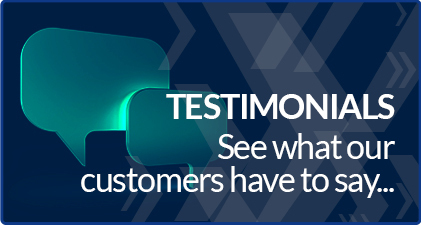 We are here to educate you on the advantages of these structures and ensure that you are making a confident decision and are happy with your purchase. 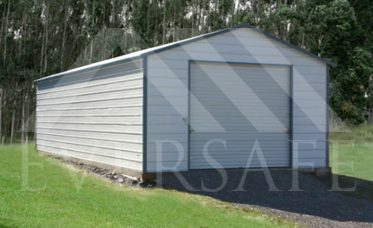 There are a selection of options to choose from and these structures are built to last and you can be confident will be used on your property for decades. 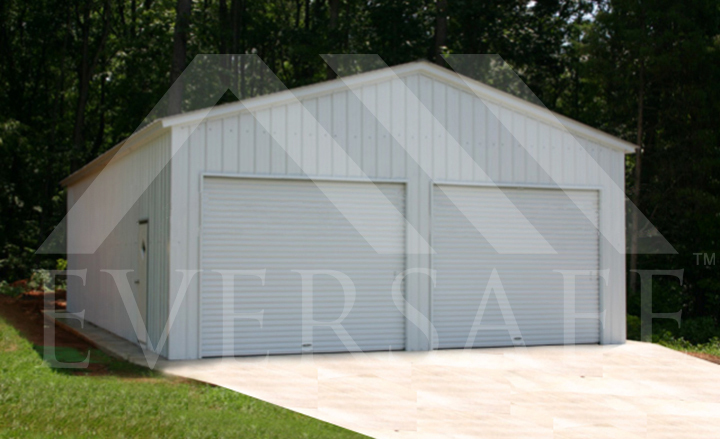 Our steel garage buildings last longer and require less maintenance than wood garages. 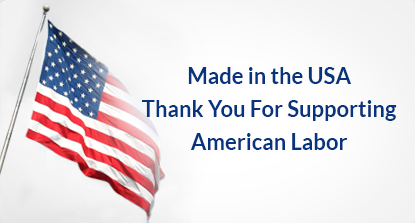 They’re also affordable and made with superior American made steel with American labor. 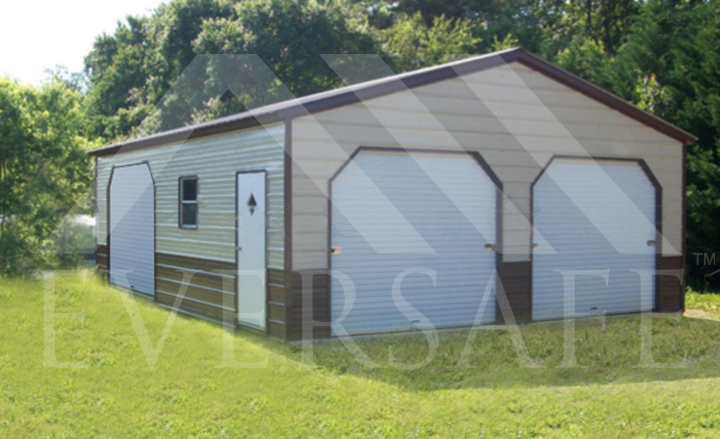 Call one of our knowledgeable prefab garage kit specialists today at 1-800-374-7106 for more information on your new metal garage building. 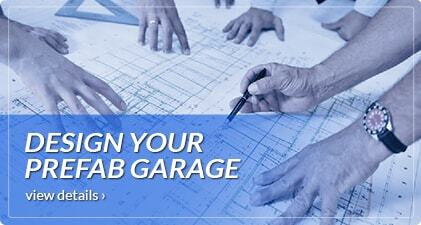 We guarantee you the best quality steel garage in the industry that will meet all your needs.